If you have old bicycles you no longer need, consider donating them to a worthy cause this holiday season. You can donate your old bikes to Boston Bikes and the Roll It Forward program. Boston Bikes manages the city of Boston’s cycling programs, such as the popular Hubway bike share. Roll It Forward is one of its projects, which repairs and distributes bikes to low-income Boston residents and children who may not otherwise have access to a bike. To date, the program has distributed over 2,400 bicycles. In 2013, we had the pleasure of contributing to Boston Bikes and Roll It Forward. We donated bike helmets for their youth bike giveaways. We also attended some of the events to help fit helmets, and we got to see first-hand how much the children love seeing those bikes! We encourage you to consider this organization if you have a bike you are not using. Donating is easy. You can choose among several locations in Greater Boston. Landry Bicycles is collecting bikes at its Boston, Natick, Norwood and Westwood stores in December. In addition, on Wednesday, Dec. 18, from 6:30 – 8:00 p.m., Landry’s Bicycles in Natick is hosting a meet and greet reception for bike donors. 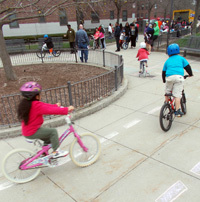 It will celebrate local bicycle-recycling efforts in the area by Boston Bikes’ Roll It Forward, the Worcester Earn-A-Bike and Bikes Not Bombs, another group that, among other things, does great work teaching Boston children how to ride and repair bicycles (and another fine organization that we support! ).